There are two distinct avenues for headphone amplification today – either buying a product from a brand with a well-established reputation for making headphone-based products, or from a brand that makes traditional two-channel audio that has ‘branched out’. Until recently, the former option was the more alluring, because it almost seemed as if long-standing audiophile companies were paying lip service to headphones. However, some of the more switched on traditional audio brands (pun – but not oxymoron – intended) have started producing products in the headphone ‘space’ every bit as well designed and fit for purpose as they do for two-channel loudspeaker audio, and every bit as good as their headphone specialist counterparts. 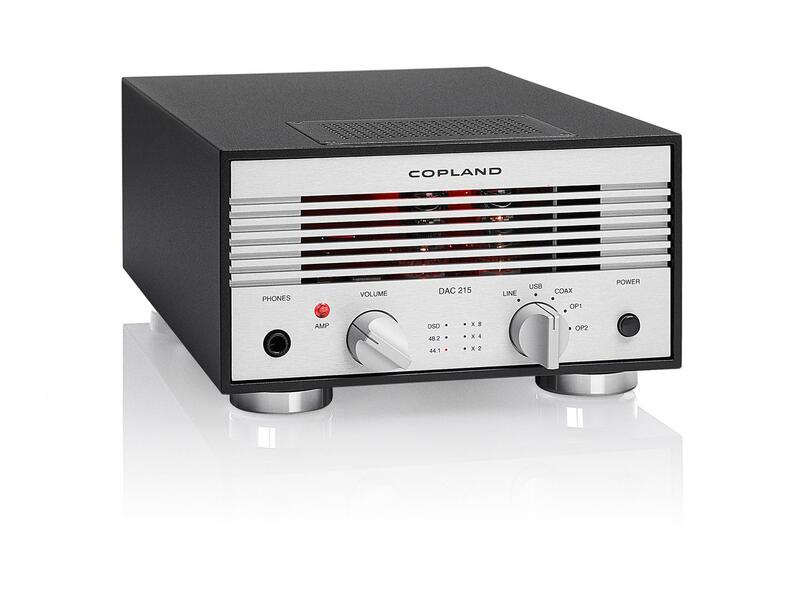 Copland – with its DAC215 – is one such company. The DAC215 is more correctly a product with feet in both camps. The feature set points to a device that sits somewhere between a high-performance digital preamplifier (with a lone line input) and a USB DAC with a built-in headphone amplifier. Both sides of the equation are considered with equal aplomb, with an ESS ES9018 Sabre DAC at the heart of the converter, a pair of ECC88s driving the headphone amplifier and line stage. The digital inputs (alongside USB) might be considered ‘legacy’ devices for those used to a computer-based audio environment, but point to a way for audiophiles with digital players and streamers of all descriptions to move into the headphone world. And, perhaps most importantly in a style-obsessed world, it looks pretty cool in a distinctly retro manner. The DAC215’s front panel, with its two glowing tubes backlit by a red LED visible through a slotted grille on the front panel, and with a pair of large dials, and a big red or green ‘glow plug’ like LED denoting whether the preamp mode is engaged, give it a look reminiscent of classic audio. The backlighting is also a handy indicator of warm up; the DAC215 takes about 40 seconds to start up, and you know when the process is complete when the backlight comes on. If you don’t like the backlight, it can be turned off using a switch behind the valves, which necessitates opening the top plate. In so doing, you are met with a neat and ordered circuit layout of DAC at the rear, amplifier to the front, with logic control and USB controller on daughter boards, and a screened off toroidal transformer power supply.